Green buildings are better buildings. In fact, buildings use 36% of the energy in the United States, according to the Environmental Protection Agency, so green buildings that use less energy help to address the very real challenges of reliance on fossil fuel and climate change. More than only being environmentally responsible, green libraries are beautiful, cost-effective, high-performance buildings that enhance occupant health and comfort. 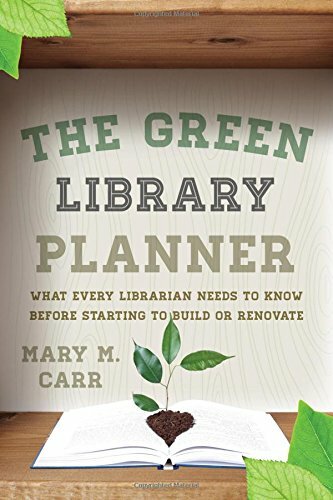 The Green Library Planner is designed for members of library building design teams who typically are not actively engaged in architecture, construction, or engineering, but who need an introduction to the rationale for green buildings, the elements of green building, and the language of the field. It will be equally useful for public officials, boards, or administrators who are considering a new green library building, a renovated library structure, or sustainable elements for a current library facility. Mary M. Carr, a library director who is also a LEED-Accredited Professional with national certification, first introduces the basic tenets of green building. She then covers the gamut of green building from design, through all phases of construction or renovation, to operations and maintenance. With this information the librarian, and related library staff and administrators, will be able to design, build or renovate, and operate the library in the best way possible, while considering the environmental and economic challenges faced, locally and globally, in the 21st century. If you have any questions about this product by Scarecrow Press, contact us by completing and submitting the form below. If you are looking for a specif part number, please include it with your message.